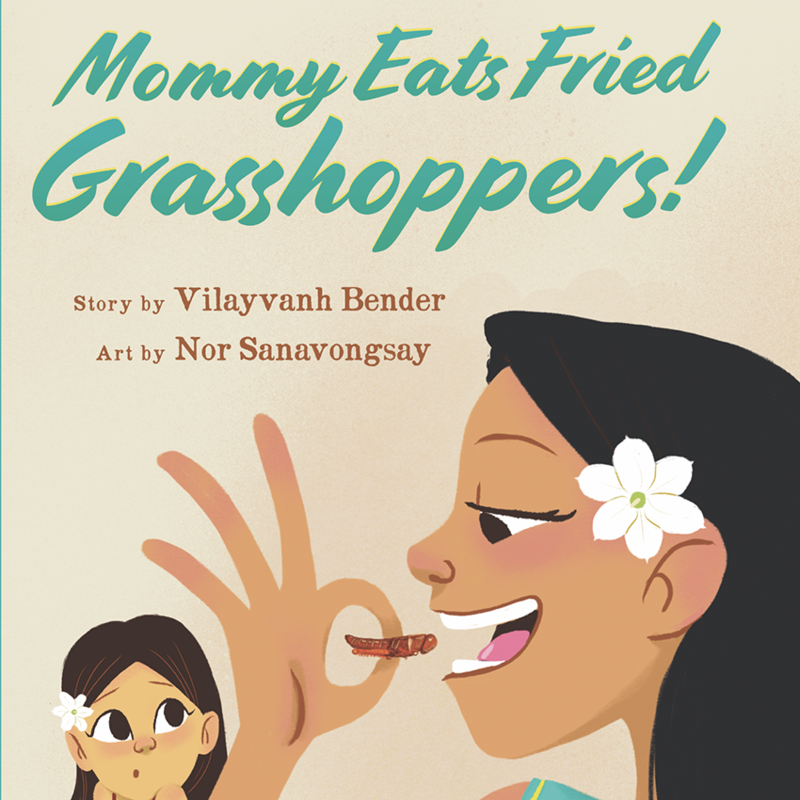 Mommy Eats Fried Grasshoppers, by Vilayvanh Bender, illustrated by Nor Sanavongsay. Sahtu Press, 2018. I don’t have memories of being read to as a kid. My parents were learning English at the same time I was. My father picked it up faster than my mother, and then he’d scold her as they took classes together at the University. “How are you supposed to succeed in this new country if you don’t learn the language?” he demanded. It always embarrassed her as she struggled through her studies and practiced speaking English. And so I decided, when I was five, that I’d read books to her and teach her everything I knew about America. It’s been over thirty years now, and she no longer needs me to teach her or read to her. But I read Mommy Eats Fried Grasshoppers to her anyway, because children’s books are written as much for adults as they are for children, and because it is a book that makes me desperately want to be five years old again, so that I could have read it to her when the country was still new to us both. It’s this cross-cultural understanding that Vilayvanh Bender seeks to establish in her children’s book. The wish for parents and children to connect is as ancient as language itself, breaking cultural barriers and generational barriers, searching for symmetry and mirror reflections because we want to see ourselves: we want to see ourselves reflected in our parents and in our children. But the thing about mirrors is that there is a wish for it to go both ways. We want to be seen as much as we want to see, despite the things that separate us. From one generation to the next, from one land to another, cultural similarities and differences can create a fog of emotions. In Mommy Eats Fried Grasshoppers, Bender effectively clears up this fog by using symmetry in the narrative structure of the story. As the daughter-narrator, Mahlee, describes how she does things in America, mirrored by how her mother did similar things in Laos, the words flow seamlessly through these slice-of-life, page-by-page moments. From eating breakfast, to doing homework, to celebrating New Year’s, Mahlee feels connected to her mother despite the different ways they move through life: what is revealed in her story is how much their lives parallel and, ultimately, converge. Mahlee thus honors her mother’s Laotian heritage side-by-side with the American customs she is familiar with. The harmony between Mahlee and her mother briefly comes to a halt when Mahlee discovers that her mother eats fried grasshoppers. In this image, we see Mahlee in the background with a bag of potato chips that, significantly, looks like a generic bag of Lay’s potato chips, but it reads “Lao’s.” A bag of Lay’s potato chips, of course, is as quintessentially American as Fourth of July barbeques, baseball, and other slices of Americana. This deliberate superimposition of Laotian culture on American culture is quite powerful, and the image haunts me to the last page: Mahlee, holding her bag of Lao’s/Lay’s potato chips, looks stunned as her mother’s huge, happy mouth opens to catch a grasshopper between her teeth. This is where the disparity between Mahlee and her mother seems to eclipse the similarity. While she accepted all the other ways in which her mother does things a little differently, she can’t seem to accept eating fried grasshoppers. Her mother offers her one and she instantly declines. “They taste like potato chips,” her mother insists, and, instead of answering, Mahlee redirects the conversation and asks to go swimming– a tactic that made my own mother laugh out loud when I read it to her because it’s so classic. “Are you sure Mahlee isn’t you?” she asked me. Once the two go swimming, the narration flows smoothly and symmetrically again as it did before the disruption of eating fried grasshoppers. In the end, of course, Mahlee tries the fried grasshoppers and agrees that they taste like potato chips, and so Lay’s potato chips literally and figuratively becomes Lao’s potato chips, in the form of crispy, salty insects. Mahlee reconciles with what she had thought was culturally strange, and she and her mother are tied together again– like the necklace of flowers they had made together. I watched my mother pat her stomach when we closed the book. “Like eating fried grasshoppers,” my mother agreed. And she didn’t say it, but I could tell by the expression on her face that the book made her feel visible, a kind of mirror that we could hold up to the rest of the world and say, See me. This is my experience. Because this book was my experience, too—mine and my mother’s. I love how my mother personified books as living beings. It’s one of the truest statements I think I’ve ever heard. “Or, if not everyone, they’re always working towards that,” I said. She smiled at my optimism and handed me the book back. I tucked it into my laptop bag. I’d read it to my own children later that night. Elizabeth “Lizzie” Tran is a Kundiman fiction fellow, a Lambda fiction fellow, and the recipient of the Jeanne Cordova scholarship for Lambda fellows in 2017. She holds a B.A. from Rollins College, an M.Ed. from the University of California, San Diego, and an MFA in fiction from San Diego State University. Her book reviews, fiction, poetry, and essays have most recently appeared in Brickroad, Vien Dong, Little Saigon, Tayo Literary Magazine, and the forthcoming Foglifter. She is a high school and middle school English teacher, and a mother of two magical little boys. She lives on the shores of southern California, spending most of her days near the ocean she can’t breathe without.